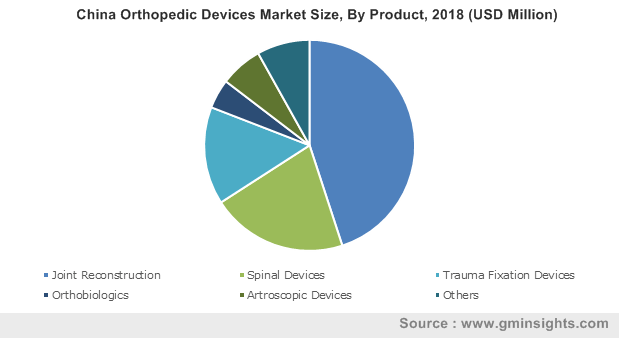 Orthopedic Devices Market size was valued at USD 42.7 billion in 2018 and is expected to witness approximately 3.7% CAGR from 2019 to 2025. Growing geriatric population base is highly susceptible for developing bone related diseases such as osteoporosis and osteoarthritis. As per WHO, the global population over 60 years is expected to reach 2 billion by 2050. Increasing base of elderly population will create significant demand for various orthopedic implants and devices. Increasing prevalence of diabetes and obesity, lack of physical activity, poor diet intake and rising trend of smoking and alcohol consumption will fuel the market demand over the forecast years. New innovations in the field of osteology should boost the development of cost-effective devices. Technological advances in 3D printing, robot-assisted surgical procedures, and smart implants will represent high impact driving factors for the global industry revenue. Increasing incidence of road accidents and sports injuries, and spurring demand for minimally invasive surgical procedures should stimulate global market growth. Availability of innovative materials and biodegradable implants for medical interventions will augment demand. Rising cost burden of expensive surgeries, high cost of implants, and dearth of skilled professionals may hinder business growth. Lack of uniform reimbursement landscape in developed countries and low per capita healthcare expenditure in developing nations will hamper adoption of advanced devices over the coming years. Joint reconstruction devices market is estimated to reach USD 22.4 billion by 2025. 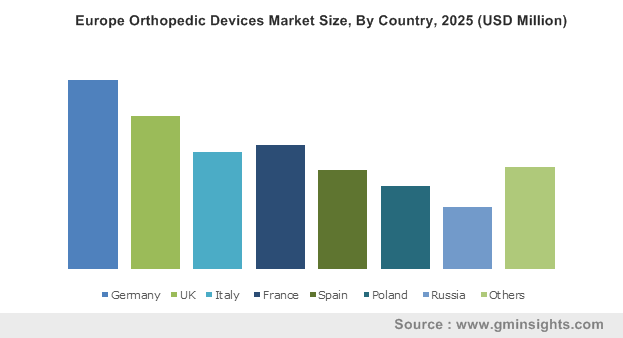 Increasing geriatric population, rising prevalence of osteoporosis and osteoarthritis and soaring incidence of road accidents and sport injuries will drive demand for artificial joint reconstruction devices. 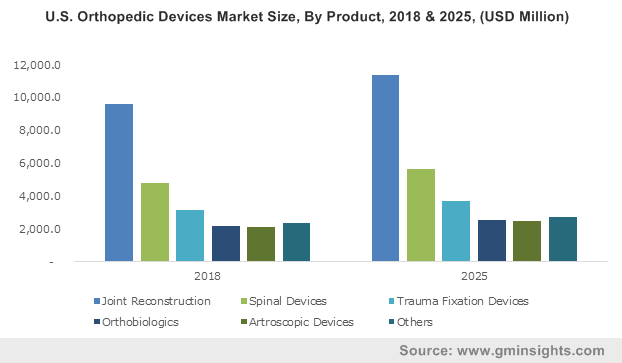 Spinal devices business will expand at 3.8% CAGR between 2019 and 2025 due to rising prevalence of degenerative disc diseases among the aged population, coupled with the novel products development for spinal disorders treatment. Most of the industry participants are exploring related business segments to broaden their product offerings and commercially exploit the lucrative market. U.S. market will reach USD 28.4 billion by 2025. Increasing adoption of advanced orthopedic solutions and improved healthcare infrastructure will stimulate business growth. Rising R&D support to develop innovative products should also augment industry expansion. Germany market size will show rapid growth of 2.5% CAGR throughout the forecast period. The presence of sophisticated healthcare infrastructure, adoption of advanced healthcare technologies and accelerated research in the field of orthobiologics and arthroscopic devices should fuel industry growth. Some of the key players operating in the orthopedic devices industry space include Stryker, Medtronic, Zimmer Biomet, DJO Global, ConforMIS, NuVasive, MicroPort Scientific Corporation (Wright Medical Group), Globus Medical, Medacta, DePuy Synthes and Smith & Nephew. Acquisitions, collaborations, partnerships, new product launches and geographic expansion are the most commonly adopted business strategies by orthopedic devices industry participants. For instance, in January 2016, Smith and Nephew announced the acquisition of Blue Belt Holdings Ltd. It provides robotic assistance in partial knee replacement. This acquisition intends to accelerate growth in this area of surgery and expand the NAVIO platform into total knee, bi-cruciate retaining knee and revision knee implants. The roots of orthopedic devices can be traced back to the time of World War I, when it was initiated as a department to heal injured and crippled soldiers. 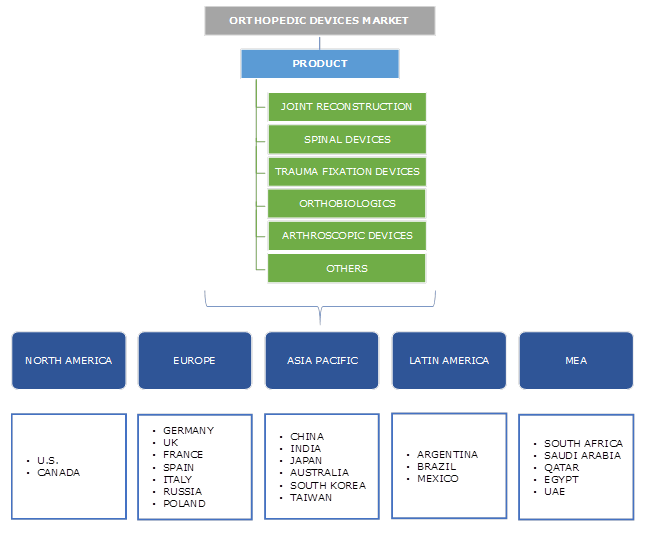 With extensive R&D activities and various developments, currently, orthopedic devices market is a multi-billion-dollar industry with steady growth in both developing and developed nations. The global market is driven by the growing government focus on reducing disease cost burden owing to growing prevalence of elderly population. Rising prevalence of osteoporosis and arthritis should drive tremendous growth in the future. Emerging economies are poised to witness higher growth than the developed ones, mainly because of increasing adoption of in developing nations and market maturity in the developed countries.